Would you buy a coffee from the Dean? 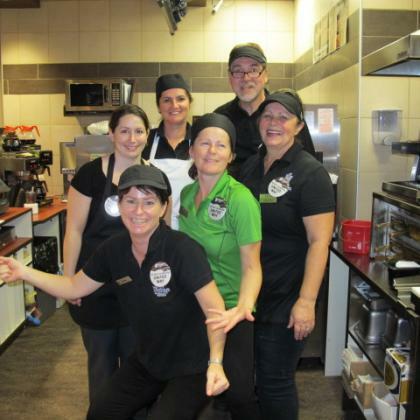 Today, .25 from every medium and large hot beverage purchased at the MSB Tim Horton's goes to the United Way and $1 from every travel mug sold. And you never know who you might see behind the counter serving you! Dr. Andy Watson will be volunteering from 9:30 to 10:30, then Dean Michael Strong takes a turn from 10:30 to 11:00, followed by the Vice-Dean of Dentistry, Dr. Harinder Sandhu from 12:00-12:30, COO Dwayne Martins from 12:30 to 1:00, Dr. Francis Chan from 1-1:30 and Dr. Derek McLachlin from 1:30-2:00. Also today, Western announced its campaign goal, with a Flying United Way Airlines theme at The Wave with President Chakma and the CEO of the United Way of London & Middlesex, Andrew Lockie. 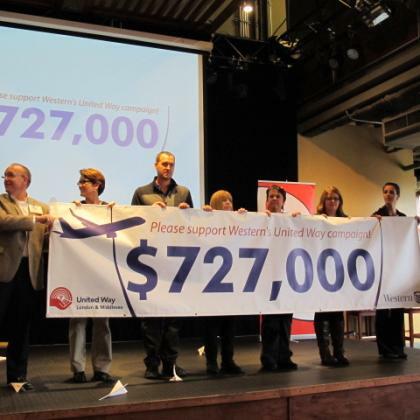 In 2011, Western made the city's largest organizational contribution to the United Way, and we hope to exceed last year's achievement in support of this year's city-wide campaign. Watch our web site for more exciting events including Pizza Day for United Way on Wednesday, October 14th.